Entertaining takes on an elegant flair when serving drinks with our stunning Arabella glassware. Asymmetrical swirls of glass are tipped with Gold metallic to add to the artis-tic look. Made of glass with Gold metallic embellishment. [value] => This decanter is absolutely stunning! I can't wait to place it on my bar cart. 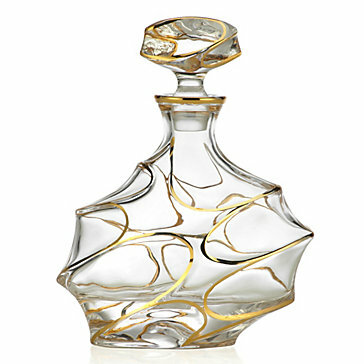 This decanter is absolutely stunning! I can't wait to place it on my bar cart.